A common error made by many parents is to buy age-inappropriate toys for their kids. It is either the toy is too big and advanced for the baby or too small and basic for the kid. In either case, the developmental and educational benefits would be lost in the child. At best, what your child gets from the toys would never be optimal. That said, even if you are spot on about the most suitable toy for your child’s age group, there is still the problem of picking the best ones from hundreds on the shelves. The toys come in various sizes and colors. The designs could be breath-taking in some, while the combination of price tag and beauty could make some of them simply irresistible to you. To make it easier in your selection process, you need to consider the following before picking any toy. Colors –The colors have to be bright. Kids love things with bright colors. You want your kid to naturally want to play with the toys without being forced to do so. Safety –make sure the materials used are non-toxic. For instance, plastics must be BPA and PVC-free. If you are not sure or if it is not clearly stated on the toy’s packaging, look for more information on the company’s website. Check to see if the toys come with small parts. These are choking hazards for kids as they like putting things in their mouths. Also, the design of the toy must preclude sharp, hard, curves. Ideally, toys should be designed wholly with rounded curves to ensure kids don’t get hurt while playing with them. Size– Take note of the size when you’re ordering from online stores. Sometimes, the pictures could be misleading since they are mostly zoomed. Many parents get frustrated when they receive a toy that seems several sizes too small. The product information normally states the real size but people hardly look at that. Reviews– Read the reviews from people who have already made a purchase. The rule thumb is to avoid the 5-star reviews; these ones tend to be misleading and mostly sponsored by the company. Go for the 3-star reviews. These are generally honest and fair from people who actually bought the toys independently. There are other factors to consider, but with these four, especially the last one, you can’t go wrong. So what are the best age-appropriate toys for kids? The list below was carefully selected and divided into categories to make it easier for you to buy toys depending on the child’s age. But you should be aware that there are some overlaps in the toys suitable for some ages. For instance, 6 months olds would find pleasure in toys designated for 3 Months olds and vice versa. However, you definitely can’t gift a 2 months old a toy made for kids 10 months old. Sometimes, you would need to make a judgment call in cases like these. Newborns are known to be excellent in just a few things. They mostly sleep, eat and poop. They can’t be bothered about other things and simply cry if they feel discomfited in any way or something is trying to re-order their immediate world in ways they find unacceptable. Up to about three months, your baby’s vision is fuzzy. They are learning to grasp at things and respond to sounds around them. At this age, the most suitable toys are those that make soft sounds and move slowly. The toys below have been specifically selected as far as suitability for newborns up to 3 months old are concerned. The Grow-with-me Gym and Ball Pit from Infantino is a unique, activity-filled toy for newborns that is parent-friendly at the same time. Made from non-toxic, BPA-free materials, it has four linkable plastic sea animals, and a 9.5 inches mesh ball around a 24 inch circular play area. Also, there are 40, very light, colorful balls for the kid to play with when they are old enough. For newborns though, there is the play pit that is comfortably soft and visually stimulating for kids to roll around on. The hanging activities toys suspended from the two crisscrossing arches encourage the development of fine and gross motor skills. As the kid move and kick their legs about, the toys above sway, making rattling and jingling sounds the kids would find entertaining. The mesh wall collapses easily due to poor design of posts holding them up. Tiny Love’s Take Along Mobile, Animal Friends is another toy uniquely designed with newborn infants in mind. The unique design means it can accompany the baby anywhere. It can be attached to baby cribs, car seat, and playpen. The toy can also be clipped to your bag so you are able to take it anywhere with you. Made from non-toxic plastic materials, the mobile can play soothing, melodious music as the colorful toys overhead spin around slowly. This provides enough visual stimulation for your newborn. The plastic clamp is fragile and could easily break. This Kid n Play Piano Gym is a plastic and high-grade polyester activity toy that packs a lot of features even older kids would really love to play with. The brightly-colored play mat comes with a piano headboard and an arch attached to the headboard. Suspended from the arch are five toys that can be shifted to any position on the arch. These toys include an elephant teether, crinkle panda, mirror, cymbal, lion, and monkey. All these provide enough visual stimulation for your newborn as the activity toys suspended from the arch sway and jangle in response to the movement of your kid. There is also soft classical music to sooth the baby or ease them to sleep. The headboard can be used by newborns to develop their motors skills. Kicking or touching the piano keys activates the music. Cause and effect would be appreciated by your newborn as a result. Since newborns love to grab and hold on the things, My First Rattle toy made by The First Years could be the perfect first gift or toy for your newborn baby. The toy is made of safe, very soft fabric of different texture and bright, high-contrast patterns and colors that would encourage or stimulate visual tracking by your baby. The four limbs around the circular body are small enough for babies to grab and hold. When held or chewed on by the baby, the soft crinkly material makes crunching noise to excite them. However, the soft jingling bells and vibrant colors are what would likely hold your baby’s attention most. The Wimmer-Ferguson Mobile Go Travel toy is a simple toy designed to optimally enhance the development of your 1 month old’s visual and other sensory centers. The simple, yet effective toy attaches easily to strollers, car seats, and infant carriers with a strong plastic clamp so that your baby is not deprived of this delightful toy any place you take them to. It has three reversible cards. One side displays bold black and white graphics while the other displays images of various colors. It is very effective in gently easing babies to sleep by the action of the gently moving cards. Jellycat’s Bashful Grey Bunny Soother, a 100% polyester plush blanket combined with a soft bunny, is one of the best comforter-toy you can gift your cute little baby. Both the blanket and bunny are very soft to touch and easy to grasp by a newborn. Don’t be surprised if your child cannot sleep or take naps without them. This could be the perfect gift item for an expectant mother. She’ll be very grateful to you in a few months. Because they baby loves holding and squeezing the bunny and blanket, this product is one of the best developers of fine motor skills in babies. Sophie la Giraffe is a cute toy made from safe 100% pure rubber and painted with non-toxic colors. This BPA-free toy would be a fine gift item for your newborn or for an acquaintance’s /family member’s baby. Sophie la Giraffe is soft to touch, makes squeaky sounds, is brightly-colored, save and easy to chew on, and nice to smell. All these combine to create an excellent toy for the development of all the baby’s five senses of taste, sight, vision, hearing, and touch. Kids learn empathy from various sources; Sophie, with her cute face and beautiful spots, would be a nice start to a 1 month old’s development of important social skills. The Gardenburg Footfinder and Wrist Rattle set adds fun into what babies love doing best when they are not eating or sleeping: moving their four limbs all over the place. It is a set of two soft, brightly colored socks and wristbands. The socks and wrist rattlers are both decorated with bugs that rattle with a gentle noise when the baby move their limbs. Both wearables are made from safe material so it is not harmful when your child inevitable puts them inside their mouth. There is no better way for a baby to develop their limbs and improve their motor skills as they interact with the bugs. Vebe’s activity spiral is a decorative toy that is basically a wrap-around soft spiral toy you can wrap around a crib handle or any rail for the baby to play with. It can also function as a stand-alone toy. The spiral toy consists of loops with attached soft toys that can be lowered down for the baby to reach while it is suspended from the club’s handle. Alternatively, you can simply hand the toy to your kid while he is lying on his back. With the bright colors and soft-to-touch nature, the toy makes an excellent companion for any curious child. Grabbing at the various parts of the toy improves motors skills while the colors stimulate the development of visual perception. Discover and Play Piano Musical toy is one of the best musical gift items to unleash and develop your child’s gift for great music. Shaped like a miniature piano, it is small and light enough for your baby to grasp and lift. There are five piano keys covered with soft material of various colors. It is a multi-mode toy that can play melodious sounds made by a drum, a horn or violin. The keys can also be pressed to count from one to five in English, French, and Spanish. In the piano’s animal mode, the child would hear sounds produced by cats, dogs, and ducks. To add to the fun, blinking lights at the top of the piano flash in sync with the sounds. Bright Starts Grab and Spin Rattle toy is a very colorful, ring-shaped plastic plaything designed to stimulate gross motor skills and auditory functions in your two months old kid. Both ends of the oval-shaped handle are attached to a transparent plastic sphere. The sphere itself is ringed around the middle by a green cylindrical band. Inside the sphere are brightly-colored balls that make soft rattling noise when the baby shakes the toy. The handle can be grasped easily by the baby; this helps in stimulating motor functions in the hands. The sounds from the beads would enhance the auditory senses of your baby. LIGHTDESIRE’s Musical Caterpillar toy is a little, no-frills toy that packs in everything required for a kid to have fun and develop holistically at the same time. The toy is a series of stitched-up sections made of soft materials to form a long worm-like product. Every section is an acoustic delight for kids. The head, when squeezed, produces a musical sound. The other sections are designed to rattle when grabbed and given a shake. Thus, you can hold it over your kid’s and rattle it to grab their attention. The various sections that make up the body of the toy are designed with different visually pleasing colors to enhance the development of the child’s visual senses. Sit-Me-Up floor seat is a beautifully designed seat shaped like a frog with a wide base for support and soft comfortable standing seat for your baby to lounge or stand safely. Attached to the arm rails of the product are two linkable toys for your child to play with. The toys are a red, orange and yellow butterfly with soft wings and flower teether. Gifting a baby this toy encourages the development of gross motor skills as the baby reach out to grasp and play with the linkable toys. The seat can be folded easily and taken anywhere with you. Most importantly, for easy maintenance and cleaning, the seat is removable making it convenient to launder using a washing machine. The Octoplush Plush toy is a bright blue, smoothly soft stuffed octopus toy with seven ‘limps’ your baby would simply love to hold or hug tightly. The octopus is made from a non-toxic high-quality satin material that is safe for the child to put in their mouth. The material can also withstand the dose of saliva and squeezes it would surely get from the child. The octopus can play soft music in three languages: English, French, and Spanish. This could be great for parents interested in having their kids exposed to more than one language. The legs of the octopus are a journey in discovery. They each teach different stuff from leaf to star to flower and so on when pressed. This is a cute toy for the development of motor skills as the baby holds and cuddles the adorable octopus. It is a good educational toy too while developing your child auditory senses. The Soothe and Glow Seahorse from Fisher-Price is another in a line of great stuffed toys that ticked most of the right boxes. It is colorful, soft, cute and extremely huggable. The seahorse has a mainly baby blue body with yellow eyes and washed-out red arms. The Mohawk at the top of the head is shiny green. All these make for an attractive combination of colors. A hug from the baby activates a gentle glow of light from the toy’s belly in addition to the music and sounds of the ocean. The 5-minute long music includes lullabies and classical music. My First Bead Buddy Giraffe is proof that size doesn’t matter when it comes to baby toys. It is a small toy but comes packed with lots of beneficial features for the baby. First, there is the gorgeous combination of colors on the toy to set your kid on their way towards the appreciation of colors. The stuffed head of the Giraffe is made of a soft to touch material. Different fabrics were used for the ears, legs, and tail to develop the child’s tactile awareness. And there are the colorful rattling rings around the neck that would surely keep the baby mesmerized with the sound it would produce when the baby waves the toy around. More auditory pleasure is present in the circular ring where the belly should be. This is filled with colored beads that make a pleasant sound when the toy is shaken. The toy has many grabbable parts for the baby to lift and carry around easily. This ball pit from Bright Starts can be much more than just a toy if you want to get really imaginative with your baby. It is a foldable floor mat that is designed with bright colors all around. At the same time, you can raise the four sides to form a wall around the mat. So you now have a comfortable sleek mat and a play pit. It doesn’t stop there. It comes with two arches that can easily be set up over the play pit. Suspended from the arches are ten colorful toys to add a bit more variety to the play pit. Watch as your kid tries to reach out and grab the toys. You can help the kid out by detaching the dolls and dropping them in the only area. Or you can add tiny balls instead. And there are 20 different soft melodies for the kid to enjoy while playing. They could serve as lullabies to rock the baby to sleep. There is so much you can do with this item. Within this age range, your baby has most of the full range of motions of their hands. They can unclench their fists easily to grasp at things and transfer objects from one hand to the next. You have to be very watchful because most objects would likely end up in their mouth. This is where you really need to make sure your baby’s playthings are non-toxic and not too small to swallow. And if your kid is already crawling by the fifth or sixth month, you can start investing in toys that move slowly to encourage your baby to move after them. The exercise would be good for their development. Basically, they would be okay with stuffed animals, activity toys, rattles, colorful teethers, playmats, squeaky rubber toys or toys with a combination of all or some of these features. Apple Park’s Belle Cow Plush Toy is a basic and simple stuffed cow toy that should be the perfect companion for your baby. The stuffed cow’s body is covered with a soft green polka-dot jumper. The dots are shaped like red, white and gray raindrops. Small and easy to hold, Belle Cow has a rattle attached to the head that makes a soft rattling sound when it is shaken by your baby. This is a fine way to learn about cause and effect while holding the soft cuddly toy. Made from 100% organic cotton material, it could be the perfect gift item for a baby shower. Children can hold onto it for several months since it is such a cuddly cute little toy. Oball’s Grab and Rattle football is the perfect gift to set your kid on the path to being the next football star. The colorful, plastic, mesh-like design of the oval ball has holes all over the body for your baby’s tiny fingers to slide in and grab the ball. Your kid won’t be doing a lot of throwing though. Rather, the rattling sound from the tiny beads embedded into the middle of the ball would excite them more. They would surely give the ball a vigorous shake constantly. The toy is smooth and made of non-toxic plastic making it extremely safe even if they inevitably have to chew on them. This is a classic ball toy concept to develop the muscle of the hands and fingers. The sensory skills of your baby would also be enhanced. Fisher-Price’s Calming Vibrations Cuddle Soother is a stuffed doll that works exactly the way it is named. It soothes babies with music and vibrations. It is a white baby bear toy with red fabric on the underside of the ears to give a bright contrast against the mainly white main body. Melodious, gently music is activated when the red heart in the center of the body is pressed. The music plays for 10 minutes along with vibrations designed to calm any restless kid. The soft, plush texture of the toy would certainly encourage your baby to give it a bear hug invariable activating the music and vibrations. The features in this stuffed bear would develop the child’s sensory perception and fine motor skills. Bright Starts’ Clack and Slide Activity Ball is an activity toy with lots of great features that would deliver huge fun to your baby. The brightly-colored plastic activity toy comes with a spinning frog in the center pole, beads chaser designed like a caterpillar, a spinning paddle-like mirror, roller balls, and several clacking rings. All these are attached to several handles fixed to the circular base and top. There are so many things to do with this unique activity ball. The handles are of different textures to give the baby a variety of tactile experience while holding the toy. With so many colors and rattling sounds, motor skills, sensory perception, and color awareness would be enhanced as the kid shakes the ball. Like the best activity toys, the Treetop Friends Activity Gym/Playmat packs a lot of features to keep a child busy for as long as possible. It comes with a soft, plush, two-sided bean-shaped ‘tummy-time’ pillow. It is wonderful as a comforter when babies need to lie on their stomachs. The two crisscrossing arches can be attached to the mat. Suspended from the arches are several colorful movable toys including a baby-safe mirror. The sounds the toys make would keep the baby fascinated for long. The sounds, soft linen material, and mirror would enhance the development of multi-sensory centers in the baby; think motor skills and the five senses for a start. Freddie The Firefly is a cute butterfly-shaped stuffed toy that would be a great addition to a baby’s activity toy or baby carrier. The brightly-colored toy features a mirror that would help the baby track images and focus; clacking rings to develop the auditory senses; a ladybug teether to soothe your child’s gums; and crinkly wings that would delight the kid. The body is made of soft velour material which is a velvety- soft to touch or hold by the kid. Freddie The Firefly Fly can also play friendly, fun jingles to keep your kid entertained. For a tiny Firefly, this cute toy certainly has a lot to offer. The use of multiple fabrics of different colors and textures would enhance tactile and color awareness in kids. The Ice Gel Teether Keys is a completely plastic key and ring combination toy. It is manufactured with the primary target of helping kids with teething issues and developing motor skills. There are three brightly colored rings of three different shapes and sizes, each with a dual-textured surface. This is to ensure variety for the baby’s tactile experience while holding the keys. All the keys are attached to a colorful ring that targets the same developmental needs as the keys. This toy is small enough for kids to hold and light to carry around easily. The soft sound the keys make when shaken is something children also enjoy. This package contains two very colorful maracas. And they are just the right sizes for baby’s to grasp and give a vigorous shake. One end of the toy is made of soft-textured pom-pom with delightful colors. The other end is where most of the fun resides. It is a spherical, transparent enclosure with three beads of different colored inside. When it is shaken, the beads make rattling sounds the baby would surely love. This is an excellent, simple toy that would enhance the development of your baby’s fine and gross motor skills. Additionally, the colors and fabric material would stimulate tactile senses and the ability of the kid to appreciate different colors. GUND’s stuffed Winky Lamb is the sort of toy that children easily develop a deep bond with. It is not hard to see why. The toy is cute and fluffy soft. It is easy to lift, grasp and hug. Your baby would surely do a lot of the hugging. Hugging could compete with the rattling sound it makes when it is shaken for special attention. Made of polyester of high quality and other fabric materials, the toy is machine-washable and comes in various colors in case you don’t want the white-colored lamb. This basic stuffed toy would improve your child’s listening skills while aiding the understanding of cause and effects. From Baby Einstein’s catalog comes the Bendy Ball Rattle toy, a multi-functional toy for your baby to hold, squeeze and give a robust shake. And of course, to exercise those lower limbs, the baby can crawl after the ball when it is rolling on the floor. Made from non-toxic flexible plastic, the mesh-like ball is ringed by a smiling plastic worm. The all glossy, brightly-colored toy has a smaller ball within. This contains rattlers that produce sound when the ball is shaken. There are convenient holes all around the ball for your baby’s fingers to grasp the ball easily. The Soothe and Glow Giraffe by Fisher-Price is a soft, cuddly giraffe that is perfect for a kid that is too restless to fall asleep. Depending on how tight the baby hugs it, it emits very soft calming light while also playing 8 different lullabies and classical music. The Music and light fade off after 15 minutes. Hopefully, the child would be having a peaceful nap by then. The stuffed giraffe is mostly beige in color with red and pink spots dotted around the body to give it a classy color contrast. It is easy for babies to understand cause and effect as a squeeze of the toy is rewarded with music and light. The toy would also develop the cognitive and motor skills of your baby. Skip Hop’s Musical Egg Shaker is three toys for the price of one. There are three cute animals in the package: an owl, a fox, and a hedgehog. The colors on each of the toys are bright and different with differently textured belly on each. This makes it easy for the baby to grip and hold the toy while at the same time giving the baby a variety of tactile experiences. When the baby waves any of the toys, sounds are enmity from them. Each toy produces its own unique sound. The toys are small enough to fit into a baby’s hands but not too small to constitute choking hazards. However, they could be wonderful as teething aids since they are made from non-toxic materials. The Baby Whoozit Stroller and travel Activity toy is a round shaped stuffed fabric product made to look like a compass with a smiling face. The toy has bright, contrasting colors. It is soft and cuddly and comes with rattlers, squeakers, crinkle paper, grasping loops. Also, under the big red nose in the middle is a hidden mirror your baby can use as a self-discovery tool. With the loop at the top, the toy can be attached to cribs, car seats or on strollers making it a perfect travel companion for your baby. The eight jutting ‘arms’ are multi-textured which helps the baby’s sense of touch. Each arm can produce sounds that provide auditory stimulation for the young one. Sassy Fascination Station is a Ferris Wheel-Rotating toys combination toy. In effect, the rotating toys can be detached from the wheel to play with as standalone toys. By simply batting the round balls, the wheel begins to spin. To add to the kid’s fascinating, music plays each time the wheel is spinning. This is a simple lesson in cause and effect for your child. The bright colors are designed to engage your kid’s attention while the different textures on the surface develop tactile sensitivity. In this age range, especially at 9 months, your baby is more active. They just don’t pick things, hold and transfer it to their mouths, they do wave them around vigorously including banging them on nearby objects. This is the age where they recognize their favorite toy is missing and might throw up tantrums if they don’t get it. And of course, in the age range, they can now sit unassisted, crawl and even pull themselves up to a standing position. Toys that move like push toys are appropriate at this stage. Cars or animals with wheels would be great too. They’d also love simple musical instruments, toy phones, and activity cubes. Generally, toys that make noise and move would be great for them. For companionship, stuffed dolls or animals would be awesome. Other categories of toys suitable for this age range include nesting cups, stacking blocks, bath toys, and interactive books. Munchkin Mozart Magic Cube is a musical toy designed to teach your 7 months old child how a combination of sounds can produce masterpieces by Mozart. The musical cube is unique by the absence of sharp angles. It has round edges and curves. On the sides of the cubes are buttons of different colors that play musical instruments when they are pressed. The sixth button, the orchestra button, combines the sounds of the other five instruments. The instruments include the harp, violin, French horn, piano, and flute. These can be combined in various ways to create 8 Mozart musical compositions. A truly wonderful way to start your kid out in the art of musical composition. Mozart Magic Cube would inspire creativity in your kid while developing their motors skills, color appreciation, and hand-eye coordination. The Wiggle and Crawl Ball by VTech is a brightly colored red and yellow interactive ball with various animals and buttons embedded all over the ball. When activated, the ball wiggles and wobbles on the floor inviting the kid to crawl after it. To grab the baby’s attention further, flashing lights are emitted by the ball as it moves. This encourages the kid to exercise their limbs. Pressing the dog, cat, and bean-shaped buttons produce the sounds made by these animals. This improves the baby’s motor skills. Numbers and colors are also taught via a collection of 45 fun songs. O Ball’s Tubmarine Bath Toy is a plastic submarine created to make bath time really fun for kids. The beige, green and blue plastic submarine can either float or move under the water when the wind-up propeller is prepped. The mesh-like design of the ‘hull’ of the submarine provides several holes for kids to grasp the toy. The holes also ensure water quickly drains out of the toy after the fun is over for the day. The submarine is set in motion by rotating the propeller clockwise until a clicking sound is heard. Releasing the propeller and letting it go would set it in motion under water. The movement of the submarine can also be replicated out of the water. This means, playing with the toy is also possible when bath time is over. Ocean Orchestra musical toy is a cute sea turtle designed with two primary intentions: to unleash the inner music composer in your kid and to let them have fun. The glossy-colored turtle is not too complicated to understand for kids. It has two music modes: Symphony and composer. The Symphony buttons when pressed produce classical music. The composer mode tests the baby’s creativity by allowing them to create their own music. There are buttons to activate or produce real instrument sounds from drums, harps, pianos, and xylophone. Given time, your baby would be able to create their own symphony orchestra. Apart from developing motor skills, tactile and auditory senses, the toy encourages self-exploration by the kid. The Twisty Figure 8 Teether is the perfect answer to achy gums for babies coming to terms with teething. This is basically a teether toy and a rattler; the two features combined would calm your restless child with the soft rattling noise and something to chew on. Shaped like an ‘8’, it is easy to grasp and is made of five different textures to give variety to the baby’s tactile experience especially for the gums. The colorful teether can twist and turn easily and when given a shake, produces rattling noises. This is wonderful for the development of the baby’s motor, cognitive and sensory centers. Sassy’s Pop n’ Push car is just the gift item for your 8 months old kid that is excited about their ability to crawl around. The top of the car toy is made of a transparent plastic dome. Inside the dome are several colorful beads. The four-wheeled, bug-shaped car is gorgeously-colored and doesn’t need batteries to move. You simply pull back the rear wheels, release and it zooms forward. To engage the child more, the beads in the transparent plastic dome of the car jump around while the car is in motion. The textured wheels would encourage tactile exploration in your kid. Other developmental aspects of the toy include enhancement of motor skills, hand-eye coordination, color appreciation, and cause and effects. Tiny Love Follow Me Fred is a very adorable and cute puppy toy packed with many features and functions that would thrill your baby and help them address quite a few growing up needs. The mainly beige, blue and burgundy toy with multicolored tail and ears is a baby-activated electronic toy that moves when it is touched. The slow and deliberate movement of the toy is combined with barking and fun tunes to attract the baby’s attention. All these encourage babies to move after the puppy and exercise their limbs. The puppy has three friendly tunes and adjustable speed control to match the child’s motor skills. The fluffy ears and tail are very good for teething babies as they can chew on them to soothe their aching gums. Sassy’s Phone of My Own should be the ideal gift item to stop your kid from bothering your phone or the remote control! It is a flip phone made of hard plastic that can really flip open and close. There are 4 buttons of different colors on the dial pad and a screen that lights up to catch the baby’s attention. Attached to the top of the blue-rimmed phone is a black and white circular arch. This holds four rings of different colors. The rings are meant to provide variety in sound and color appreciations. This is an interactive toy that would talk to your baby when any of the four buttons are pressed. This encourages language development while the flip function develops the muscles in kids’ hands. Kidoozie Press N Go Inchworm is a brightly-colored glossy worm-like toy designed like an inverted ‘V’ on wheels. This design concept mimics the way worms look like when they are moving. Press N Go Inchworm has several beads in the four wheels to attract the kid’s attention. Wheels and beads are all brightly colored in line with the overall color scheme of the toy. The toy is activated by pressing down on its back. It then moves swiftly across the floor encouraging your child to chase after it. The toy would stimulate the development of fine motor skills, problem-solving skills and an appreciation of cause and effect. The bright colors would also pique the kid’s interest in different colors. The toy would not lose its gloss easily. Spinning Swirl Ball Drop ramp is a set of two colorful plastic towers sliding ramps that comes with 4 balls to roll down the tower. The idea is easy to understand and kids can quickly start playing with it. Simply drop one a ball at the top of the tower and watch it race all the way to the bottom. Inside the ball are marble beads that clash against each other and the side of the balls on the way down. The sounds produced by the balls vary on the speed and how bumpy the ride downwards is. You can also help your child stack the two towers together to create a single 9-ramp tower. Kids find the greater distance the balls have to travel more thrilling. Hungry Pelican Learning toy brings out the empathy in kids as they try to feed the famished Pelican. The toy set contains a Pelican with long beaks and four small sea animals as food for the pelican. The sea animals include a shrimp, octopus, fish, and crab. All of them produce a unique sound when shaken. Feeding the pelican is easy. Simply open the bill and drop the food right in. The bill makes funny squeaks when it is squeezed. The action can be repeated again. A small opening on the pelican’s front allows kids to look into the belly and reach in to pull out the ‘food’. Feeding can resume again. This toy would be nice as a gift item for 9 Months as it builds self-esteem as well as develops fine motor skills and cognitive senses. Infantino’s Stick and Spin High Chair Pal is a monkey with many tricks up its sleeves. You’d never know it by just looking at the little red, beige and white toy with an arch over the head connecting the two hands. Inside the arch are 4 differently-colored rings that are a major part of the exciting things this toy can do. Underneath one leg is a suction cup to attach to a flat surface like a chair. Under the raised leg is a mirror for babies to work on their self-awareness. After sticking it to the flat surface, the top part can be made to twist. It does this with a clicking noise to attract your baby’s attention. The toy can also talk, play music and mimics a panting dog. The ears too are not left out as they make a crinkly sound. The toys you get for your kid should reflect their newly acquired and greater mobility and intelligence. The kid can now crawl very fast, stand up easily with the aid of an object and walk around while holding on to the furniture. Your baby would also be able to use objects for specific purposes. For example, they’d know a ball can be pushed with a stick or use a hammer to strike an object. In other words, the problem-solving skills are taking root fast. The appropriate toys for this age group include stable push toys, shape sorters, colorful balls, toy telephone, stacking blocks, and interactive books, etc. Are you struggling with managing all your baby’s toys? The Suction Baby toy holder, like the name suggests, intends to resolve that problem for you. In addition to being a good teether, it is designed to keep all your baby’s toys within reach so you don’t have to scramble around the house looking for them. The toy has a suction cup base that holds it in place. All the baby’s toys can be safely secured using three tethers. Say bye to lost toys with them fastened like that. Your baby can pick and throw his/her toys as much as they want; they would never be far away and are always within arm’s length. The Suction Baby Toy holder has plastic leaf-like clip at the top that lets you attach the toy to a baby carrier, stroller, or diaper bag; in other words, you can take it anywhere with you. Develops motor skills, hand-eye coordination, etc. Baby Beats Drum is a bowl-shaped interactive drum and music toy. 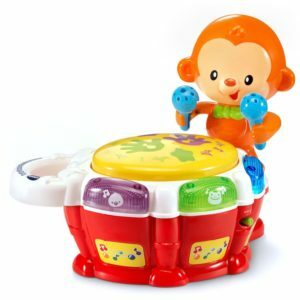 Colorful and glossy, the drum features an orange monkey holding blue drumsticks and several buttons for activating sounds and music. The top of the drum has two sensors that produce different sounds and tunes when it is tapped by the baby. This encourages the development of motor skills and teaches the kid basic cause and effect. There is also a learning button that asks your kid to find colors, animal shapes and flashing lights making this a really great educational toy. Over 70 songs, melodies, sounds, and phrases have been incorporated to ensure variety. 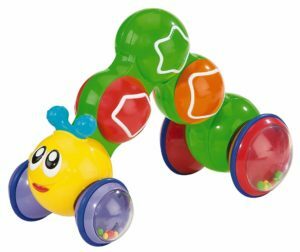 Activity Loops Teether is an early development toy that features a suction cup base, brightly-colored crisscrossing plastic loops, and several beads, rings and balls that can slide across the loops in any direction. Because of the suction cup base, the toy can be attached to flat surfaces making it a very portable toy. The Activity Loops Teether toy is a fun way to learn a few things in a safe way. Sliding the beads, balls and rings up and down the loops can keep the baby occupied for a long time. This helps the development of motors skills and the basics of cause and effect. As a learning toy, the moving parts and loops offer the opportunity to appreciate various colors and shapes. The toy is also an excellent teether. The loops and moving parts are made of soft plastic so the baby can chew on them to soothe aching gums. Fat Brain Toys’ pipSquigz Loops is a simple, basic toy. It delivers a decent dose of sensory experience as well as been a good teething toy. The bright orange-colored toy comes with three rings of different colors and a suction cup at the base that can stick to any flat surface. When stuck to a flat surface like a table, the baby can simply flip and release the toy. The rings would rattle as the flexible toy returns to its default position. If your kid is strong enough, pulling on the toy would produce a popping sound when the suction base is freed from the surface. This should delight and amaze kids. Watch them repeat that again and again. The concept of this toy is to encourage and develop repeat action and teach cause and effect. It enhances motor skills too. The bumpy surfaces of the toy are excellent for relieving aching gums. Gift your 11 months old a personal music player shaped like a portable radio with this Spinning Tunes Music Player by VTech. The music player toy features a dial that’d teach your kid the names of musical instruments and concepts; an attractive plastic CD that spins when the music dial is turned; and an antenna that turns with a clicking sound. It also has two buttons that introduce animals and play fun melodies when pressed. The buttons would light up to fascinate the kid further. The toy is light enough for your kid to lift and move around with using the easy-to-grip handle at the top. Take your child to the dream world of flying in their own airplane with the HABA Aircraft Indoor Mounted Swing. It is basically a swing designed like a classic airplane complete with a propeller at the back. However, the blue, deep pink and orange toy is simply a baby’s seat made with quality fabric and long straps to hang or mount the seat instantly turning it into a swing. The seat is very comfortable and is adjustable to fit the size of your baby. That means it could still be useful even as your baby grows older and bigger. From Green Toys comes a classic eco-friendly stacker toy your 11 months old would have a swell time with. Like all the best stacker toys, it is a bit of a puzzle toy that teaches concentration and enhances motor skills and hand-eye coordination. Kids can also come to terms with repeat activity and learn patience with this stacker. It is a made up of eight graduated pieces; the last piece is a round cup that fits the smallest piece like round cap. You should be curious to see how many other ways your kid can come up with to play with this toy. Surprises await you. Help to develop your baby’s balance with the combination bike and walker Ancaixin Baby Balance Bike. It is a low, four-wheeled bike with a modular design that takes just 3 steps to assemble. The wheels are wide for balance. And for further safety, the steering has a 135-degree limit turning ability. The carbon steel frame ensures the bike is durable while the seat and handlebar add comfort to the mix with the soft Eva materials they are made of. With its fine packaging and beautiful design, this could be the perfect gift for a kid just approaching their first year. This’ just the gift item to help them gain self-confidence while having fun.